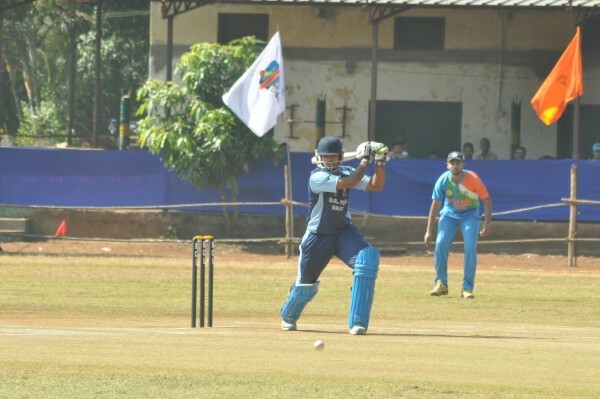 Sairaj Yuvraj Warriors won the inaugural match against Neena Sai Sports by 15 runs in the P D Dhotre Foundation Belgaum Champions League Cricket tournament which got underway today at Union Gymkhana. Man of the Match Zeeshanali Sayyed and Nagendra Patil’s opening stand of 155 runs decided the course match. Batting first after winning the toss Sairaj Yuvraj Warriors made an aggressive opening stand of 155 runs in just 18.1 overs scored 183 runs for the loss of 5 wickets in the allotted 22 overs. Zeeshanali Sayeed belted the bowlers of Neena Sai Sports to all parts of the ground scoring 88 runs in 60 balls with 15 fours and Nagendra Patil scored 59 runs in 56 balls with 8 fours and 1 six. Shoeb Manager picked up 4 wickets and Rabbani Dafedar picked up one wicket. In reply Neena Sai Sports were in hunt of the win but some tight bowling by Sachin Shinde and Anirudh Joshi ensured Sairaj Yuvraj win. Neena Sai Sports could score 168 runs for loss of 6 wickets in 22 overs thus losing the match by 15 runs. Vinayak Kamble scored 40 in 32 balls with 4 fours and 1 six, Rameez Nanadi scored 39 runs in 29 balls with 5 fours, Shoeb Manager 37 with 4 fours and 2 sixes. Rohit Porwal scored 19 runs. For Sairaj Yuvraj Warriors Sachin Shinde and Akshay Juvekar picked up 2 wickets each and Sachin Salunke and Anirudh Joshi picked up one wickets each. Zeeshanali Sayyed was declared the Man of the Match and was presented the trophy and Cash prize from Vijay Patil, Director of Vishal Construction.